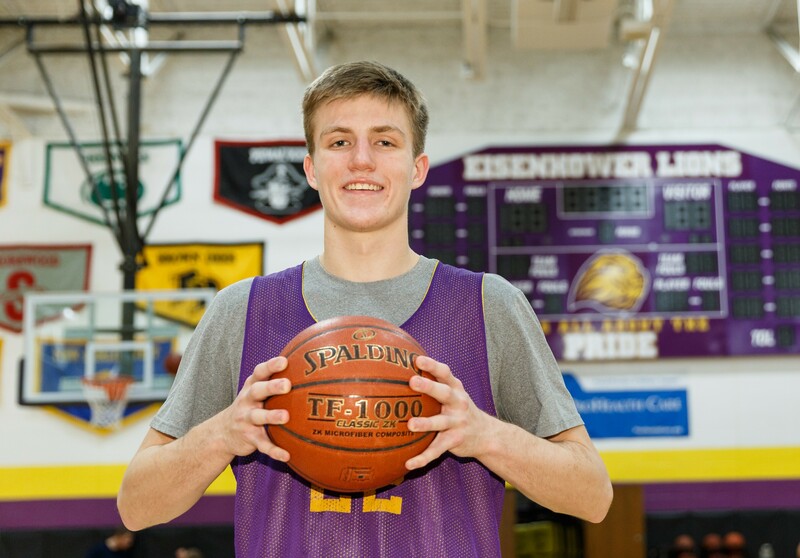 New Berlin Eisenhower senior forward Sullivan Kulju never wanted people to tell him the only reason he was good was because he was tall. So he has worked hard his entire career to show them he was the total package. "It helped being so big early on," he said. "I just thought with other kids my height I wanted to prove I was good from an early age. I was always working hard on my skills. "I hate it when people say 'You're just good because you're tall.' So from an early age on it's been a big thing to not just be tall but to be able to do as many things as I can." 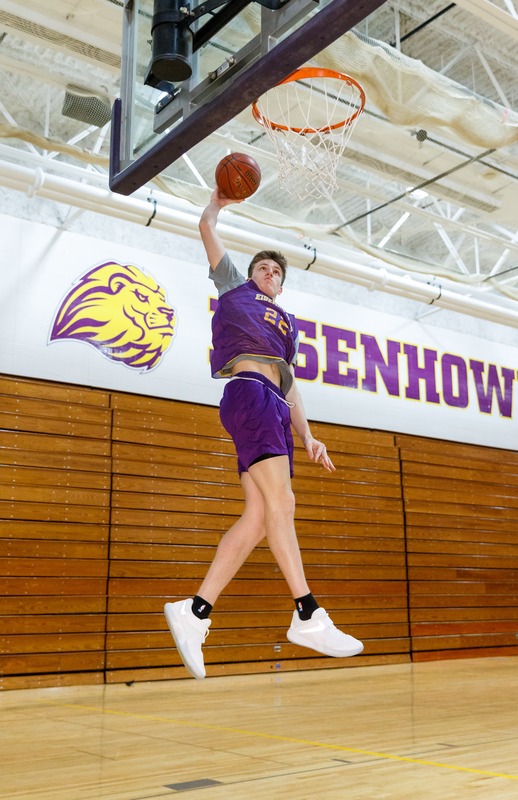 There is no doubt the lanky Kulju - who is 6-feet, 6 inches tall - is the total package. Whether tipping in a rebound, driving the lane or dropping in a 3-pointer, Sully's game keeps getting better. Kulju was lucky because he was able to grow into his length growing up. "It kind of bummed me out (at first)," he said. "I never got to hit that big growth spurt. I kind of always steadily grew. Which looking back on it, it was a good thing because I never had to grow into my body. I got kind of lucky to just gradually grow." Eisenhower's veteran coach Dave Scheidegger remembers seeing Kulju in the Lions kids programs. "He was on our third-fourth grade select teams," he said. "We run camps here and he has always been to all the camps. I've known Sully since he was a little tyke. But then he has never really been little at any age." Scheidegger talked about what drew him to Kulju. "First thing you see with Sully is a love of movement," he said. "A love of playing. He loves to compete and he just has the drive and the passion that is easy to see right away." Kulju is a two-sport star for the Lions, having a nice fall season with the football team as a wide receiver, earning honorable mention honors. But he didn't play the skill positions growing up because of his size. "I played for the first time in third grade," he said. "I played tackle. Before that I played flag. I was a right guard and a defensive tackle. "I love the atmosphere, the energy and the passion of a football game. It's just different than basketball. It's so smash mouth. It's a lot of fun. I love football." Coach Matt Kern talked about Sully's improvement on the football field. "We knew because of his size, he was a unique challenge to other teams," he said. "We had to decided where he fit into our schemes. He was a potential big-play guy, a red-zone guy and he had great rapport with Bryce. "His role reflected a lot with the growth of our team. We used him more in the short passing game last year. He was very underrated with his hands. We were absolutely 100 percent pleased with his play." But basketball is his bread and butter - he was honorable mention as a sophomore and second-team all-conference as a junior. This year he is averaging 15 points and 5 rebounds per game and he actually is second in 3-pointers. And with the game on the line, he wants the basketball, something some basketball players run away from. "His true natural strength is his ability to score," Scheidegger said. "He likes the ball - not every player does - and he is not afraid of the responsibilities either. You know some guys are good rebounders, some guys play good defense, but the responsibility to score the ball is a main one. And not everyone wants that responsibility. Sully cherishes it, loves it. That's huge! "Let's face it, you need kids on your team that think 'score.' You can always scale down, but I don't think coaches give confidence. The players have to build their own confidence. Coaches support, but the ultimate turning the corner, that player has to make that decision himself whatever it is." Sully is very aware of what he can do and what he needs to do to get better. "My strength is being close to the basket and use my quick first step," he said. "And my shot's gotten better. But my ball handling and shooting can always get better to be more consistent. And I always need to work on defense and conditioning. Those are two big things." Scheidegger sees big things for Kulju down the road. "Let nature take its course," he said. "As he moves on, he can fill out a little bit. Like all the players, getting stronger in the weight room. You see the bodies on these guys. It's the bigger, faster, stronger thing. "How big and strong can you do with what nature gave you. Now it's what can you do to make it better. But that's every athlete, especially for those athletes who move on in the sport." Kulju has some very simple, but positive goals coming into the season. "My goal every year is to be better than we were last year," he said. "Be more efficient, more effective. I wanted to get my assist numbers up. I want to get a big playoff run. That's the whole point of the season and everything. All those numbers and everything, they don't mean anything if you can't get past the first round. "Everyone is feeling good right now. It's fun to come to practice, everyone has a good attitude and we're playing really well right now. We knew it would happen and it's happening right now which is good." The Lions have gotten their act together as a team at the start of January, winning 12 of their last 13 games, including their last 8 in a row with games against New Berlin West (Feb. 17) and South Milwaukee (Feb. 22) left. Kulju and Miller have formed a devastating scoring duo during this latest drive - Mr. Inside and Mr. Outside. Miller averaged an outstanding 19.8 points and Kulju 14.5. "I love Bryce. He's a great kid and a really great player," Sully said. "When he gets hot, that just helps everyone. People are running out at him and people are forgetting about me. It opens things up in the middle. I love assists. That's probably the most fun, kicking the ball out and we hit a 3. That's a big momentum play. That's fun." Kulju and point guard Sam Hluchnik are team captains, something Sully takes pride in. "I do feel I'm a good leader. I wanted to be captain for a long time," he said. "It's been a goal of mine ever since I joined the team my freshman year. So to finally fill that leadership role and have more responsibility; it's a pressure, but a good pressure. "To have people look to you, vote you to be a captain. It's a really big honor. I have a good relationship with all the guys on the team. It's a mutual respect kind of thing. They'll tell me if I'm doing something, just like I can get on them." Scheidegger likes what he sees from Sully's progress when it comes to being a leader. "He started a little slow, but the ownership is happening," he said. "The trust and the sincerity of players has to be there between everybody for you to play good basketball. That comes from all players, but that's coming from Sully. And usually in most sports, your best athlete needs to be your best character guy. You see it in Aaron Rodgers, but you see it with some bad examples in college and pros. "But Sully has been a good role model. As we've improved here, he's bought in, he understands everything - he's been with us for a while - and of course the kids look to him. They voted him a captain. He has progressed very nicely as we went up and down in this season." FAVORITE MOVIE: Pulp Fiction, Dazed & Confused. Action. WHAT DO YOU DO TO RELAX? Watch Netflix. MOST MEMORABLE SPORTS MOMENT: Triple Overtime game with Brown Deer as a junior. WHAT WOULD YOU LIKE TO DO IN THE FUTURE? Major in Business Management and play basketball. Still looking at colleges.